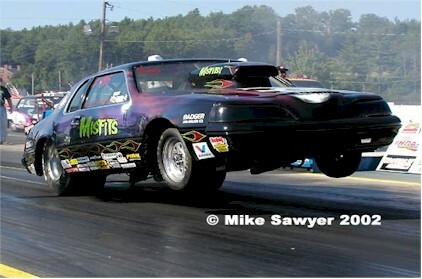 Vinnie's ride for the 2003 season will be Scott Gardner's Misfits-sponsored 1987 Ford Thunderbird. Vinnie will race the car in the Super Street category on the Division 1 Lucas Oil Drag Racing Series trail. When off of the throttle stop, the car, powered by a 460 cubic inch big block Ford engine, travels well into the nine second zone at upwards of 130 miles per hour. 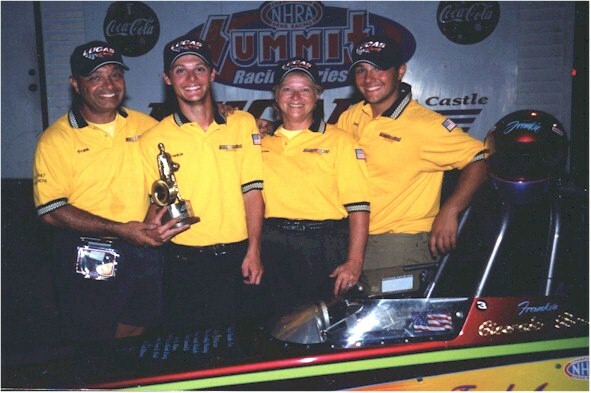 The Tax Bracket Racing Team in the Cecil County Dragway Winner's Circle following Frankie Super Comp victory at the final Division 1 Lucas Oil Drag Racing Series event for the 2002 season. The win helped propel Frankie to a seventh place finish in Division 1 Super Comp points for the year. 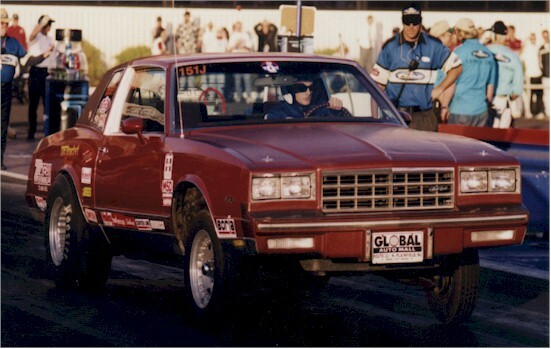 Here is Frankie behind the wheel of John Zulla's 1982 Chevy Monte Carlo at Pomona Raceway. 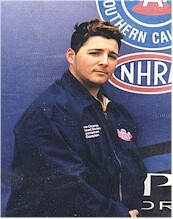 Frankie, who drove Zulla's car to victory at the 2002 Summit E.T. Racing Series Bracket Finals, will again be in his 1968 Chevy Nova for 2003. 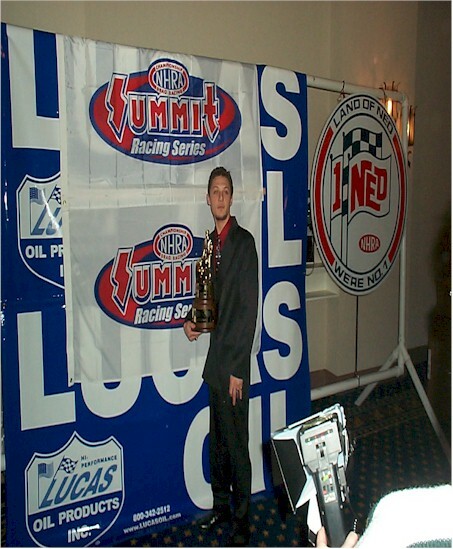 Frankie is seen here accepting his award for becoming the 2002 NHRA Division 1 Street Eliminator Champion at the Division 1 Awards Banquet. In addition to the Wally, Frankie also received a Gold Card, jacket, and championship ring. Frankie is seen here with the other Street eliminator divisional winners. Joining Frankie and the rest of the group in the photo is Stock and Super Stock ace Dan Fletcher. 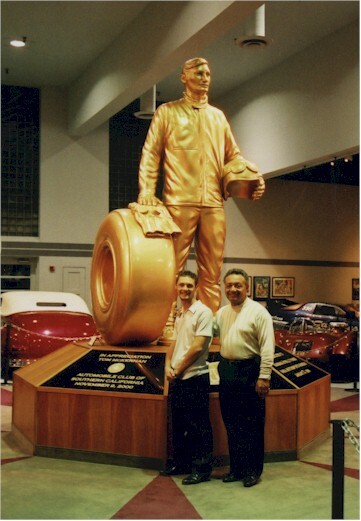 Frank and Frankie are seen here standing in front of "Wally" following the Summit E.T. 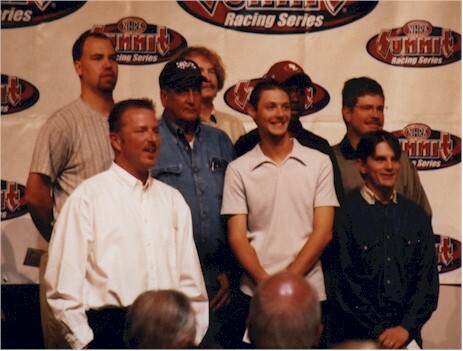 Racing Series Award Banquet that was held at the NHRA Motorsports Museum in Pomona California. While Frankie didn't come home with the National Championship Wally, fun was had by all...when it wasn't raining. Pomona California on a good day. While it rained most of the weekend, it stopped long enough for Frankie and the rest of the team to grab some breakfast. Frankie, Frank and Vinnie were joined by Pro Stock Bike rider Antron Brown's father. 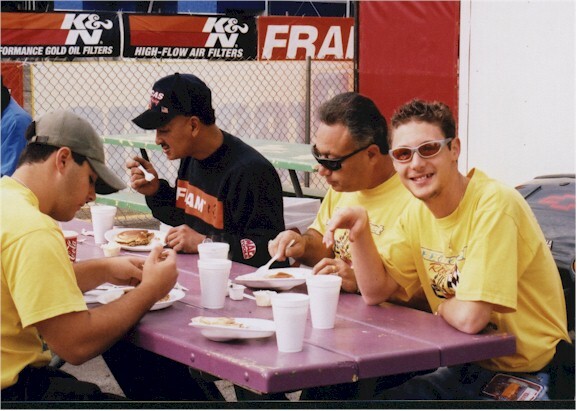 The Tax Bracket Racing Team is seen in the Mason-Dixon Dragway Winner's Circle after Vinnie drove his 2000 KCS Jr. Dragster to a win in the Race of Champions event held at the divisional race there in 2001. It was Vinnie's first win in five tries. 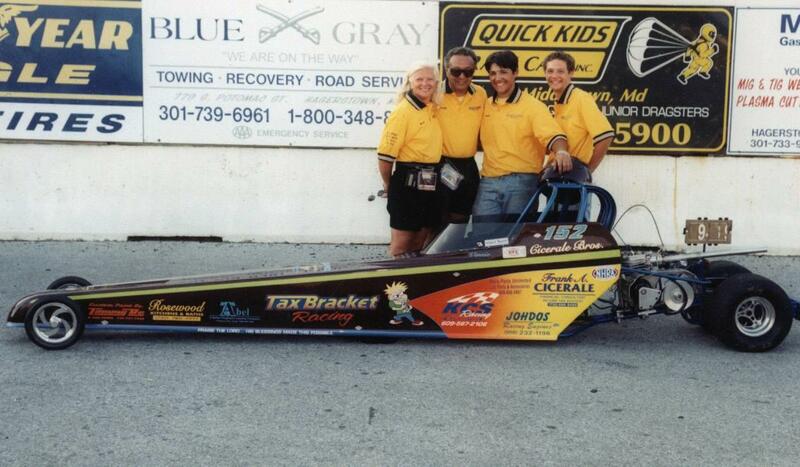 This is the Tax Bracket Racing Team's 1994 Pro Start built Super Comp dragster. The car is driven by Frankie, and off the throttle stop will go in the low eight second zone at speeds approaching 165 mph. 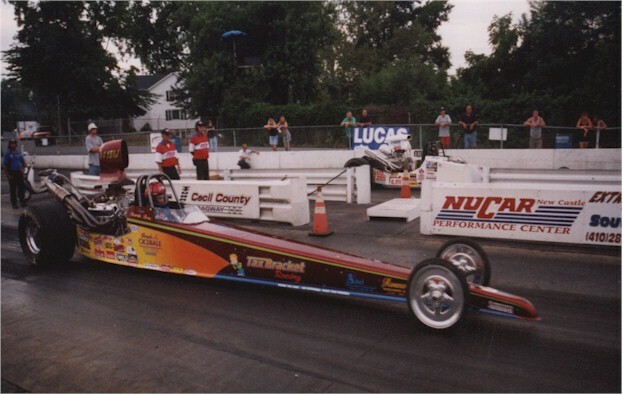 Frankie finished seventh in Division 1 Super Comp points in 2002, and hopes to improve on that finish this year. Frankie's Nova in action at Island Dragway. Running in the Street class, Frankie's best pass with the car has been a 11.99 at 110 mph. He has finishedsixth, second, and third in points at Island Dragway in the past three years. Frankie's 1968 Chevy Nova. Originally equipped with a 400 cubic inch small block Chevy, it now furnishes a 406 CI small block Chevrolet. 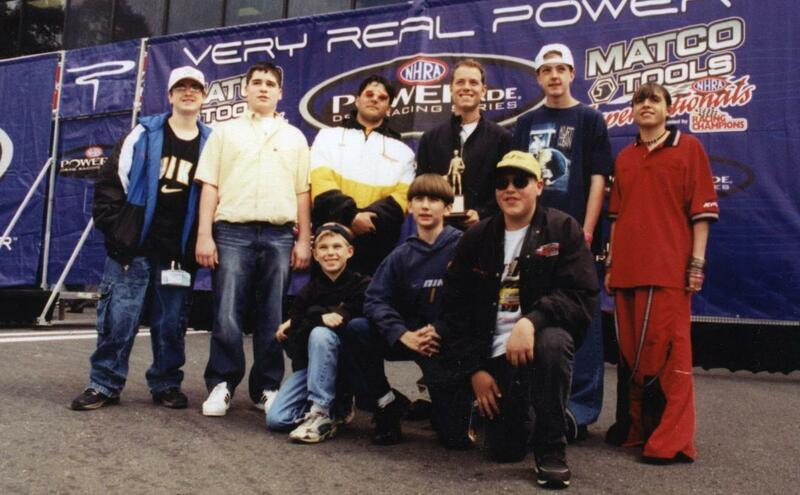 At the 2002 Matco Tools Supernationals, Vinnie and the rest of the championship team that won the Team Championship Award at the 2001 Eastern Conference Finals were honored. Each member received a Wally for being a part of the team that won the title.